Article written by Dr. Tina Storey – Board member and peer volunteer at Limerick Mental Health Association. Limerick Mental Health Association (LMHA) was founded in 2002 to promote positive mental health in the Limerick area. Since the foundation of LMHA in 2002, the landscape of mental health services has changed dramatically in Ireland. In particular, best practice is now to have people with lived experience of mental health difficulties (“peers”) involved in designing the services, training and support programmes. Wellness Recovery Action Planning (WRAP) training programmes. The Board of Management has changed completely since 2015, and new regulations around the governance of charities have added levels of oversight and reporting to the management of LMHA’s services. At every Board meeting, great ideas are proposed, and the Board considers the benefits and practicality of all suggestions. But as we have only limited resources of funding, personnel (voluntary and paid), and time, we need to decide how to focus our energies on the areas and projects that would have the most positive impact in line with our goals. Therefore, the Board decided in early 2016 to draw up a strategic plan. We engaged a skilled external facilitator, Mary Blackmore, to lead workshops to help us to decide on our mission, vision and values. Moreover, with the help of facilitator Sinéad Doody, we reviewed the organisation’s strengths and weaknesses, opportunities and threats, and began to form a set of aims for the future of LMHA. Ensure our organisation is effective and working to best practice standards. For each goal we have specific objectives, and also actions to meet those objectives. All these concepts were put together into a single document, our Strategic Plan 2018‑2021. Our Strategic Plan will provide the basis for Limerick Mental Health Association actions from 2018 through 2021. The Strategic Plan was launched publicly on 17th May 2018 at the Engine Innovate Centre on Cecil St. in Limerick. Everyone involved in the development of the plan was glad to see it finally on paper and now we can get stuck into the actions to meet our goals. In addition, the launch was a lovely, inclusive event, with speeches from the LMHA Chairperson, Dr. Jennifer McMahon; the Project Manager at Le Chéile, Claire Flynn; also speaking Chief Executive Officer of Mental Health Ireland, Martin Rogan; Board member and peer volunteer, Dr. Tina Storey; a reading of her short story about Le Chéile by a member of the Writing Group, Noreen de Barra; the performance of her original composition “How wonderful you really are” by Amy Fleming and the Music Group; as well as a general sing-song with the assembled company. The Board of Management of LMHA would like to extend its sincere thanks to everyone involved in the development of the Strategic Plan. 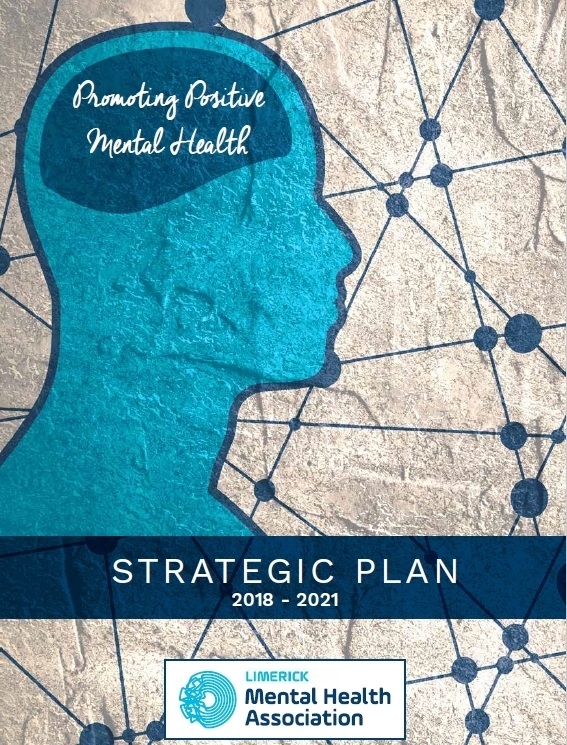 The Limerick Mental Health Association Strategic Plan 2018-2021 is free to download and can be obtained by clicking here. This entry was posted in #LiMental, Le cheile, Limerick Mental Health Week, mental health, WRAP and tagged engine innovate centre, governance, le cheile, limerick mental health association, limerick mental health association launch of strategic plan, limerick mental health week, lmha strategic plan, mental health stakeholders, mission vision and values, promoting positive mental health, strategic plan, strategic plan 2018-2021, strategic plan launch by Jamie Davern. Bookmark the permalink.